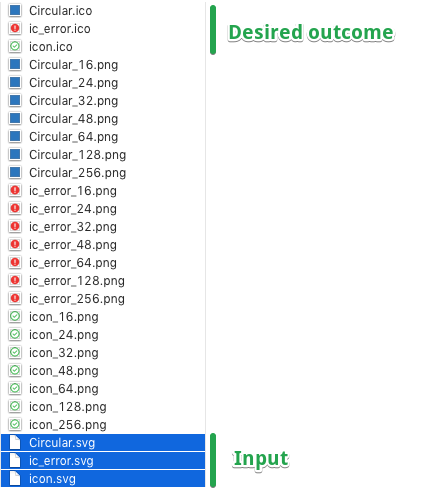 I have a lot of .svg icons that each need to be converted to an .ico file that contains multiple resolutions. The background needs to be transparent. How do I do this in bulk? I'm on Windows 10. Software info: I have access to the whole Adobe CC package. A free solution would be preferred. Second, you need to run script, which creates multiple png and pack them into ico file. Telegraphics have excellent Photoshop plug-in for this purpose. Download version of the Telegraphics ICO (Windows Icon) Format plugin that suits your system. Install plug-in by copying it to Photoshop plug-ins directory, restart Photoshop. Start Photoshop and check if under Help -> About Plug-Ins is a ICO plug-in mentioned. Create new document 256x256 px. Place your PNG image as smart object. Adjust size and position of object, if needed. File -> Save As.. and choose ICO format. Change size of image to smaller and repeat previous step. As you understand, you can easy create Action for this if manual adjustment of the PNG is not needed and run it as a script for all sizes. Not the answer you're looking for? Browse other questions tagged svg icon file-conversion or ask your own question. Automatically convert high res image or svg into multisized ico?